There are many problems facing traditional colleges and universities, these include higher tuition fees, budget cuts, and course shortages. This is especially true for adults who are returning to college after many years since they last stepped foot in a classroom. With many millions of students currently enrolled in fully online degree programmes and more than 10 million taking online courses as preparation for degree courses or vocational courses on subjects which are aimed at their work skills, online education has clearly become one of the most popular higher education alternatives. The continually improving reputation of online learning has also helped fuel its expansion, as initial concerns have faded in the face of evidence that shows that online learning can be just as effective as face-to-face education. All of this means that students, from working professionals to recent school leaver, find many reasons to take all or some of their courses online. Below are some advantages to online learning. From traditional three-year degree programmes to one or two year vocational courses, higher education today offers a variety of options for students. This means that no matter what students wish to study, from Organisational Psychology to History, they can find online the courses or degree programmes they need. They can also earn every academic qualification online, all the way from a Level 2 Diploma or GCSE to a Master’s degree. Online courses can be a more affordable option than traditional colleges. Though not all online degrees have less expensive net tuition prices than traditional colleges, associated costs are almost always less expensive. For example, there are no commuting costs, and sometimes there is also not any required course materials such as textbooks because those are often available for free online. As there are no physical classrooms you can study in the comfort and privacy of your own home. Broke your leg… never mind you don’t need to leave the house! Stuck in hospital? Study in your pyjamas! Lectures and other materials are electronically sent to the student, who will then read them and complete assignments. Online courses give students the opportunity to plan their study time around the rest of their day, instead of the other way around. Students can study and work when they are at their peak energy, whether that’s early morning or late at night. Course material is always accessible online, so there’s no need to plan special trips to a library either. All of this makes online learning a good option for students who need to balance their work and family commitments. Online courses do not always have to fit into the normal “academic” year which traditional college courses do. If the course is a year long it will often start from the date you start. Even if that date is not in September and finishing in June. 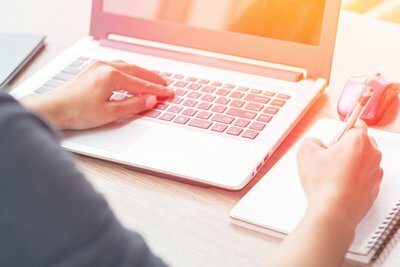 While there is conflicting evidence about the rate of online student participation versus participation in traditional courses, one thing is certain: online courses offer shy students the opportunity to participate in class discussions or chats with more ease than face-to-face class sessions. Some students even report that online courses are easier to concentrate in because they are not distracted by other students and classroom activity. Students can take online courses and even complete entire degrees while working, while in-between jobs, or while taking time to raise a family. This academic work will explain any discontinuity or gaps in a CV as well. Also, earning extra qualifications can show prospective employers that you are ambitious and want to remain informed and prepared for any new challenges. Even if someone wants to complete extra qualifications, it doesn’t mean that they want to leave their current job. For many students today, college costs mean that it’s necessary to continue working while in college or university. The previously mentioned flexibility of online courses enable students to keep working while also pursuing academic qualifications. These are just a few of the many advantages of taking online courses. Students in online course programmes are able to manage their time, learn the materials that are presented, and complete assignments on their own schedules.